It is officially cookie season! 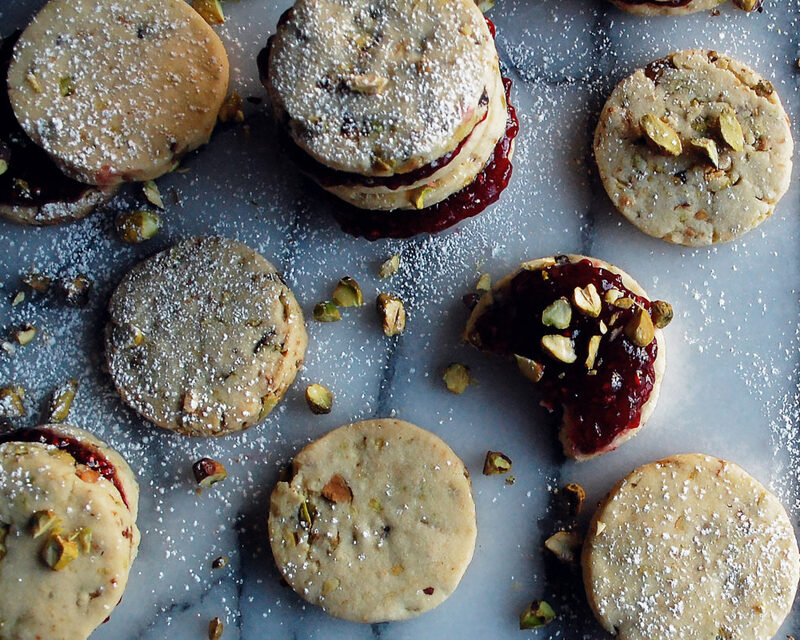 Starting things off with the most delicious raspberry pistachio shortbread cookie sandwiches. Shortbread might just have to be my favorite type of cookie. It’s buttery, simple, and has such a classic flavor. Typically, every holiday season we make some sort of shortbread cookie around here…and this year it’s these cookie sandwiches. 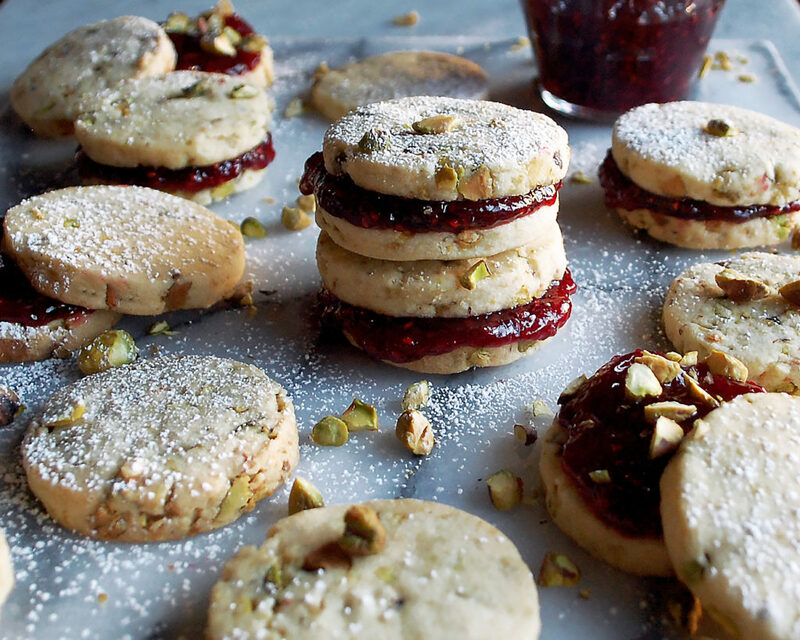 I simply took our family shortbread recipe and mixed in toasted pistachios. 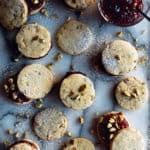 I know it doesn’t seem like much, and it is definitely an easy addition, but the pistachios add a whole new flavor and texture to the shortbread. You can taste the nutty pistachios in every bite, and they give the cookie just a little bit of crunch. The trick is to make sure you finely chop the pistachios. If the pieces of pistachios are too big, the shortbread will be crumbly and hard to roll out. Other than that, the recipe is very straightforward. The cookies will be ready in no time, and from there they’ll just need to be cooled (make sure to “taste test” a few while they’re warm, though) and slathered with raspberry jam. The cookie sandwiches are festive and everyone will love to nibble on them after a huge holiday meal…maybe alongside these hot chocolate floats! You can absolutely use any flavor jam you’d like, but I think that raspberry jam works perfectly. Preheat the oven to 350°F. Combine the butter and sugar in the bowl of a stand mixer. Using a paddle attachment, cream together the butter and sugar, scraping down the sides of the bowl as needed. Once the mixture is smooth, mix in the vanilla extract. Gradually add the flour, mixing on low speed first and then faster once all the flour is added. Once the dough comes together and the sides of the bowl are clean, turn off the mixer and add the pistachios. Mix for a second or two more until the pistachios are incorporated into the dough. Shape the dough into a ball, wrap in plastic wrap, and refrigerate for 30 minutes. Turn the dough out onto a floured surface. Cut the dough ball in half so it’s easier to work with. Roll out each piece to ¼” thick. Use a medium-sized, circular cookie cutter to cut out the cookies, using as much dough as possible. Carefully remove the excess dough around each cookie. Use a small offset spatula to transfer each cookie onto a cookie sheet. Gather the excess dough and reform into a ball. Roll and cut again. Repeat this process until all the dough is used. There should be a total of about 30 cookies. Bake the cookies for 12 minutes. Let the cookies cool for 5 minutes on the cookie sheet. Transfer the cookies to a cooling rack and let cool completely. 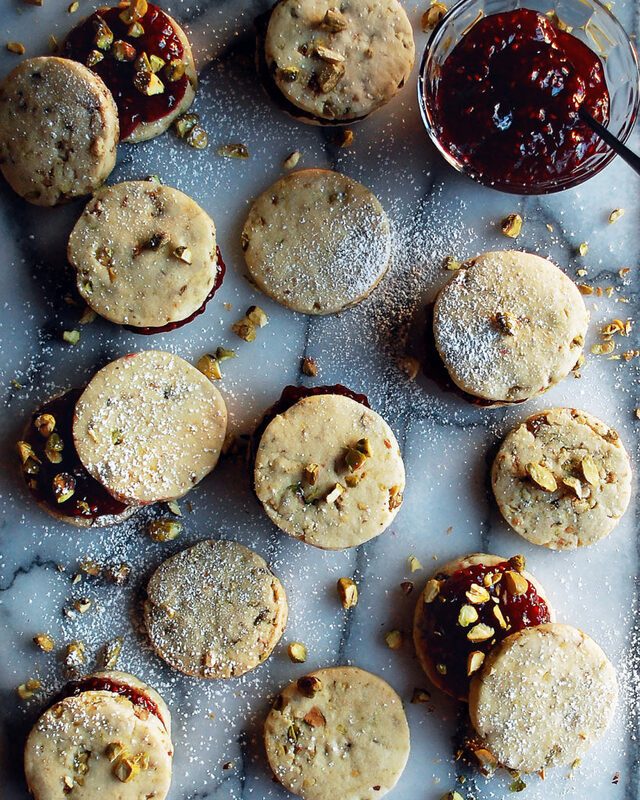 Spread the bottom side of a cookie with a generous amount of raspberry jam. Place another cookie on top, bottom side down. Repeat until you have used all the cookies. 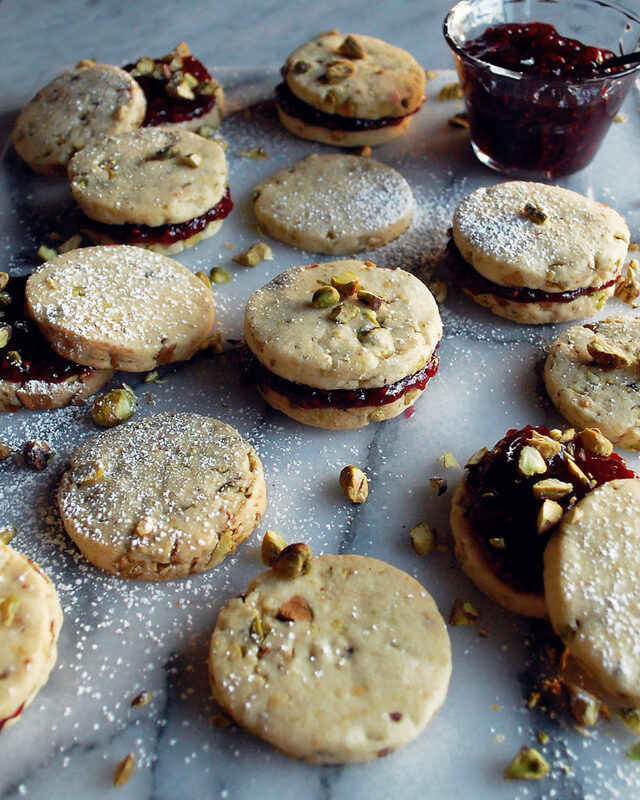 Dust the cookie sandwiches with powdered sugar before serving.